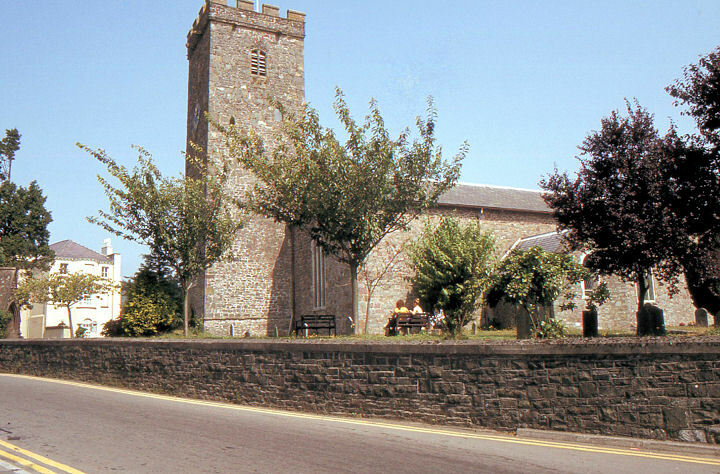 Both the Parish Church of Saint Peter's and the town of Carmarthen itself are steeped in history. Carmarthen is Wales' oldest town and Saint Peter's, a Grade II listed building, is thought to be the largest church in the Principality. 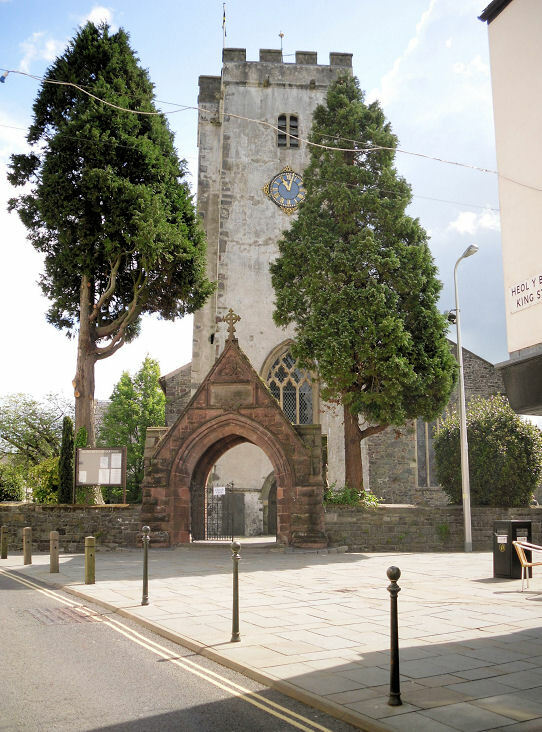 It is Carmarthen's original parish church and its oldest building still in use for its original purpose. Saint Peter's has stood witness to many events over the centuries. Its old stones have watched over a thousand years of life and death - everyday life in this ever-changing town. They witnessed the evolution from a rural Welsh settlement into a parish, a township and a busy thriving cosmopolitan market and county town - thanks mainly to the influence of the castle and the Church. Its monoglot Welsh language has also evolved into a bilingual population. They witnessed too the Industrial Revolution bringing with it tin making, rope making, woollen production, printing and publishing. The town has always had a very strong connection with local agriculture and food production which brought our famous ancient market into the forefront. It has also had a strong connection with education and the changes it brought over the centuries - the monastic communities and schools, colleges and, in recent years, our new university. The translation of the Bible into the Welsh language took place here in the town's Bishop's Palace. It has been involved in both national and local politics and the county headquarters is here. Carmarthen has seen the huge changes in transportation too - the good old horse and cart, the train, the lorry, van, bus (initially the charabang), tractor and the shipping - yes, Carmarthen was a busy sea port! We mustn't forget the effect of the Protestant Reformation on both Saint Peter's and the town and, indeed, the effects of war and rebellion including the Rebecca Riots. Indeed, all the ups and the downs - happy times and sad times, good times and bad times. Saint Peter's has even seen links with royalty - nine reigning monarchs in fact - six kings and three queens - Henry I, Richard III, Henry VII, Henry VIII, Edward VI, Mary, Elizabeth I, George III and Victoria. Read on and you'll learn more about their connection with this ancient parish church! The passing years have left their mark on the church - and it has most certainly left it's mark on those who have worshipped within its walls. It has gone through different phases in its long history to cater for the changing needs of local peoples and the religious changes of the Protestant Reformation in the sixteenth century. It remains a living building and continues to address the demands of the contemporary world. Although the exact date of the church's foundation in unknown, its recorded history dates from the reign of King Henry I (1100 - 1135). The earliest known record of Saint Peter's is found in the Chronicle of Battle Abbey - the abbey built in Sussex by William the Conqueror to commemorate his victory over King Harold in the Battle of Hastings in 1066. It states that the church was conferred upon Battle Abbey by Henry I "in the time of Abbot Ralph" (1107 - 1124). Battle is some two hundred and seventy miles from Carmarthen - in the South East of England. However, it is very likely that St Peter's had existed for very many years before this. The possibility that a Celtic pre-Norman church originally stood on the site of Saint Peter's cannot be ruled out, however, since the church lies just inside the west gate of the Roman walls of Moridunum (Roman Carmarthen) and the churchyard appears to have been circular or oval in origin, a characteristic of Celtic practice. This suggests it was a 6th or 7th century church. A few years after it had been given to Battle Abbey, in 1125, Bishop Bernard of St David's was able to give the church to Carmarthen Priory who then owned it throughout the Middle Ages. After the dissolution of the monasteries, it fell to the Crown under whose patronage it remained until 1816, when it was transferred to the Principal and Tutors of St David's College, Lampeter (some twenty five miles north east of Carmarthen). By 1907 the church was in the gift of the Bishop of St Davids. The first recorded vicar of Saint Peter's was Richard ap John in 1278. Saint Peter's is the largest church in the Diocese of Saint David's being 52 metres from west porch to east window and 15 metres wide across nave and south aisle and built of local red sandstone and grey shale. 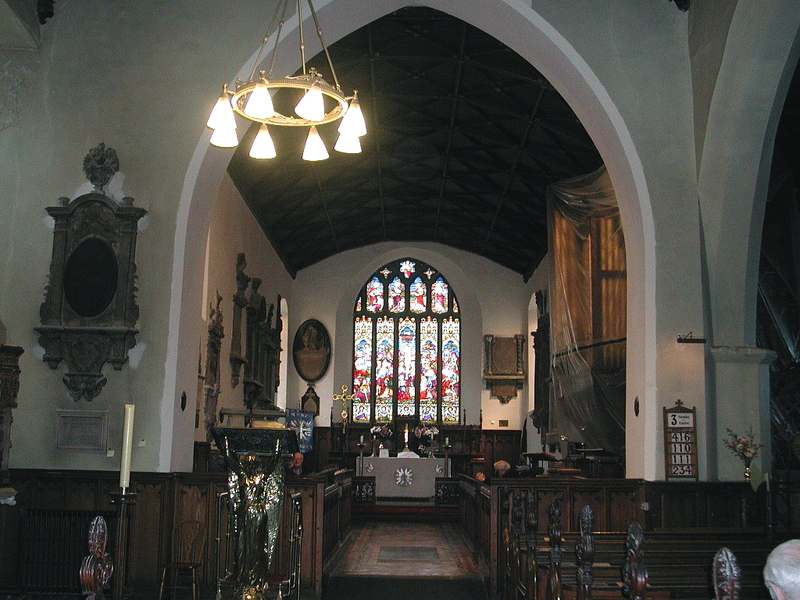 It consists of five-bayed nave, three-bayed chancel, north transept (now the lady chapel), seven-bayed south aisle including, uniquely among Welsh parish churches, a Consistory Court. It also has south-east porch, south porch, three-storeyed west tower, clergy vestry and adjoining choir vestry. The north aisle of the nave, the chancel, the north transept (Lady Chapel) and parts of the tower probably date from the 13th century and the rest of the tower dates from the 15th century. Most churches across the kingdom had been greatly neglected during the suppression of the monasteries and, after the dissolution of Carmarthen's Priory of Saint John, it was felt that Saint Peter's needed to be enlarged and the south aisle was added in the 16th century. In the porch stands a Roman altar. A 13th century stone coffin lid can be found nearby. Memorials line the church's walls and date from 17th, 18th and 19th centuries. The organ, was originally ordered by King George III for the Chapel Royal at St George's Windsor but he later decided to present it to St Peter's. Saint Peter's had the only Consistory Court in Wales. It was the Consistory Court for the Diocese of St David's which used to be presided over by the Chancellor of the Diocese. It heard matters of ecclesiastical law including matrimonial and probate matters. Occasionally it dealt with more important business - such as the trial of Bishop Ferrar for heresy in 1555. The Court has been here for many centuries but the present furnishings date from 1855. The tower contains a ring of eight bells of which four are the original bells cast by Abraham Ruddhall of Gloucester in 1722. 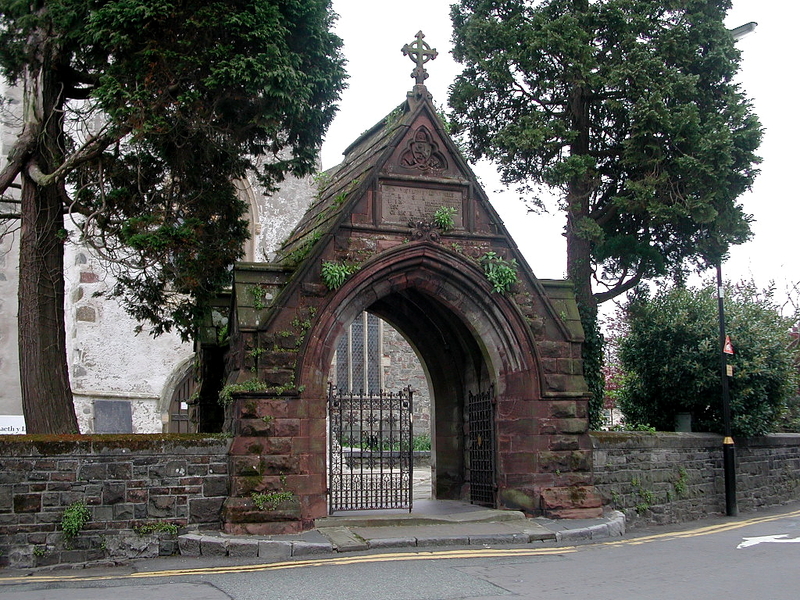 The churchyard has a lych gate in its north-west boundary which was erected as a memorial to the Reverend Latimer M. Jones (vicar 1863-1877). A major restoration programme was carried out on Saint Peter's at the beginning of the twenty first century. The floor of the Chancel and Consistory Court was removed in 2000 and a new re-enforced replacement floor constructed - this entailed the temporary specialist removal of the magnificent eighteenth century George III pipe organ - archaeologists were in attendance. This area had been an ossuary - very many bones were found - they were left in situ. The new floor was re-tiled with the original nineteenth century tiles. Essential weatherproofing work to the tower was undertaken in 2001 and, in 2002, all the ancient monuments within the church were cleaned and restored. Over one million pounds was spent on the total restoration work. Buried in the chancel is Charlotte Augusta Catherine Dalton (died 1832 aged 27 years), grand-daughter of King George III and his first wife, Hannah Lightfoot, (married in 1759). Sharing her tomb is her niece, Margaret Augusta Prytherch (died 1839 aged 8 years), great-grand-daughter of the king. The large brick vaulted tomb, with a domed roof, situated in the centre of the chancel and directly in front of the altar, was found by archaeologists in September 2000 during restoration work; it was not disturbed. It was clearly marked with a stone memorial slab giving the family connections and dates. youngest daughter of the above James Dalton. in the Ninth Year of her age'. It is not known whether the burial was a secret affair but, certainly, no record was kept and knowledge of the burial was not handed down through the generations. The tomb and memorial had lay hidden under a tiled floor since 1876. The then Prince of Wales had fallen in love with Hannah Lightfoot, a London Quaker girl and daughter of a London linen-draper, and married her in complete secrecy at Kew on the outskirts of London on 17th April, 1759. They went on to have three children.The marriage was never dissolved. Two years after their wedding, in 1761, now king, George III married Charlotte Sophia of Mecklenburg-Strelitz who became his queen. One of George III's daughters by Hannah, Catherine Augusta, married James Dalton of Carmarthen, a doctor and an officer of the East India Company, in 1823. They had two sons and two daughters - Charlotte Augusta Catherine and Caroline (who was mother of Margaret Augusta). Between the Chancel and the Consistory Court is the eighteenth century piped organ built by George Pike England on the orders of George III. The king had originally planned that the organ should go to the Chapel Royal, Windsor. However, he changed his mind and through his link with Carmarthen decided to give it to Saint Peter's. The tomb of Sir Rhys ap Thomas of Dynefwr (died 1525) and his wife, Lady Janet, can be found in the South Aisle. Rhys ap Thomas was born in 1449 and on his father's death inherited the wealth of the estates based on Llandeilo Fawr - some fifteen miles east of Carmarthen. Rhys was instrumental in the accession of Henry Tudor, Earl of Richmond, (later Henry VII) to the throne of England in 1485. Henry Tudor took an army from Pembrokeshire and Rhys gathered together a band of his tenants and led them to fight for Henry at the Battle of Bosworth Field (22nd August 1485) - near the city of Leicester. It was the last significant battle of the Wars of the Roses between the Houses of Lancaster and York. The Lancastrians won and King Richard III, last king of the House of York, was killed, marking the end of the Plantagenet dynasty. Henry Tudor was crowned King on the battlefield - the first monarch of the new Tudor dynasty. It is believed by some that it was Rhys who killed Richard III although there is no such evidence. It is, however, very likely that he was killed by one of the Welshmen led by Rhys. King Richard's body was buried without any pomp in the church at Leicester's Franciscan Monastery. Half a century later, the church and monastery were demolished after its dissolution - orchestrated by King Richard's successor, Henry VIII. The grave was lost in the mists of time. In an archaeological dig in early 2013 in search of the grave, his remains were discovered under a Leicester car park. In March 2015, they were laid to rest in Leicester Cathedral – but a stone’s throw from where they had been found. The newly crowned King Henry VII immediately rewarded Rhys by making him Knight of the Garter. Shortly afterwards, he appointed him Chamberlain of the Royal Castle of Carmarthen. Later he was made Chief Justice of south Wales and ruled the area in the name of the King. He also bestowed on him valuable lands in south and west Wales. He was also appointed Privy Councillor and was Mayor of Carmarthen on three occasions. Sir Rhys continued his allegiance to the Tudor dynasty, taking part in Henry VIII's invasion of France in 1513. It is said that both Tudor kings, Henry VII and Henry VIII, placed implicit trust in Sir Rhys who was allowed to rule his corner of Wales like a king and to die a natural death. He died in February 1525. On his death, Sir Rhys was buried in Carmarthen's Church of the Grey Friars - where he had lived his final days - but, like the Franciscan Monastery at Leicester in 1535, the Friary at Carmarthen was disbanded in 1538. 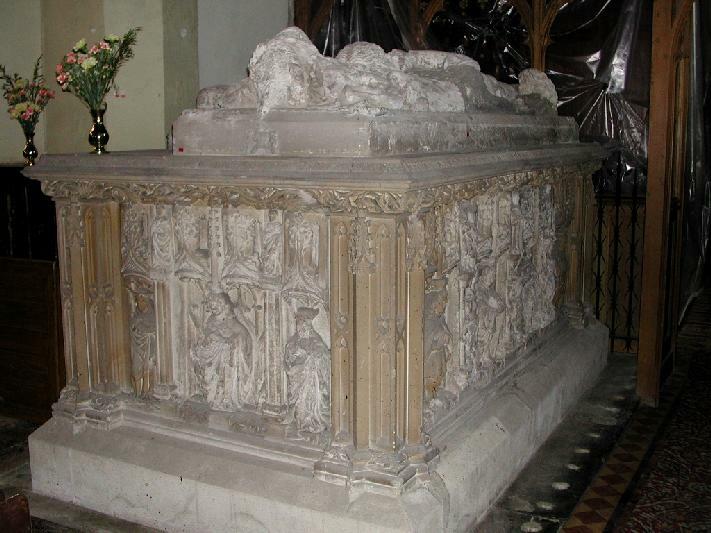 Unlike Richard III's tomb, Sir Rhys' tomb was moved - to Saint Peter's - and placed in the Chancel. In 1866, Sir Rhys' descendant, Lord Dynevor, rebuilt the tomb and in 1886 it was moved to its present position. It is the largest and most impressive monument in the church - on which are the effigies in alabaster of Sir Rhys, in complete armour, with his wife, Lady Janet. It is richly ornamented with small figures, escutcheons and shields charged with armorial bearings. Buried in the chancel is Walter Devereux, First Earl of Essex (1539 - 1576), father of Robert Devereux (the Second Earl) one of Queen Elizabeth I's favourite courtiers. 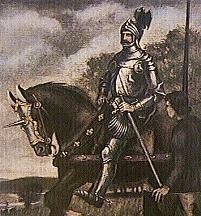 His body had been brought from Ireland, where he had served the queen as Earl Marshall. Walter Devereux's wife, Lettice, was a granddaughter of Anne Boleyn’s elder sister, Mary Boleyn. After her affair with Henry VIII, Mary married William Carey (1520) and they had a daughter, Catherine. Catherine Carey married Sir Francis Knolleys and they had three daughters. One, Lettice, married Walter Deveraux and, after his death married Robert Dudley, 1st Earl of Leicester. Catherine and her three daughters were said to have a very strong resemblance to King Henry! 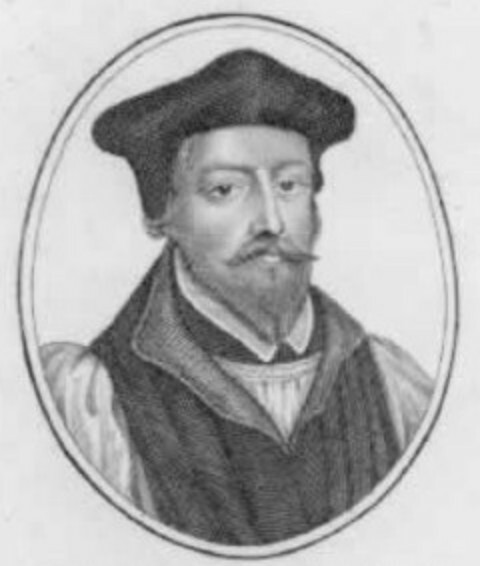 Edmond Meyrick (1636 – 1713) was Vicar of Saint Peter’s from 1672 to 1689. His elegant monument, with Latin inscription, is in the chancel. In his will he left benefactions to the church for sermons to be preached on the day of his baptism and ordination, and funds for a charity school in the town. He was also a major benefactor of Jesus College, Oxford, where Meyrick scholarships are still awarded today. Both he and his wife are buried in the Vestry. The Consistory Court (or Bishop's Court) was used for administering ecclesiastical law - it is the only one of its kind in Wales. On one of its walls is a memorial to Sir Richard Steele (born in Dublin, 1671 and died in Carmarthen, 1729), dramatist, essayist, famous contributor to 'The Tatler', 'The Spectator' and 'The Guardian' and first publisher of the modern periodical - the magazine. Educated at Charterhouse and Oxford, he was a friend of Joseph Addison and the poet Alexander Pope. Sir Richard's remains are buried in a tomb beneath the memorial. However, in October 2000, archaeologists, working in the church during restoration work, found, within his tomb, his skull perfectly preserved in a lead casket into which it had been placed in 1876 when earlier work was being done to the chancel and Consistory Court. Sir Richard met his second wife, poet Mary Scurlock, a native of Carmarthen, at his first wife’s funeral. Their relationship was said to be stormy. Mary died in 1718 and is buried in Poets Corner at London's Westminster Abbey. Another tablet commemorates General Sir William Nott, distinguished soldier, who was buried in the churchyard in 1845 after a distinguished career in India and Afghanistan. Nott was born in 1782, near Neath in South Wales, the second son of Charles Nott, a Herefordshire farmer, who, in 1794, became an innkeeper of the Ivy Bush Inn at Carmarthen (now the Ivy Bush Ryal Hotel). His inn advertised: "Come in, eat, drink, be merry and pay Nott"! He then joined the volunteer corps in 1798, obtained a cadetship in the Indian army and went to India in 1800. In 1825 Nott was promoted to the command of his regiment of native infantry and, in 1838, on the outbreak of the First Afghan war, he was appointed to the command of a brigade. His services were highly commended and he went on to be knighted. He returned to Carmarthen and died there in 1845. Six years later a bronze statue was erected (cast from cannon captured at the Battle of Maharajpur) in what had been the market square and was renamed Nott Square. Queen Victoria gave 200 guineas to the memorial fund. Yet another memorial in the Consistory Court is to Bishop Robert Ferrar of Saint David's - the Protestant Martyr. Ferrar was born in Halifax and ordained at Nostell Priory. In 1548 he took part in the royal visitation of the Welsh dioceses for the protestant child king, Edward VI and he made him Bishop of St David's, helping to establish the Reformation in Wales. His episcopal duties were hindered by a series of clashes with local gentry and cathedral clergy, culminating in a notorious lawsuit before the Privy Council, in which he narrowly avoided being deprived of his bishopric. When Edward VI died aged 15 years in 1553, Queen Mary came to the throne. She re-established her kingdom to the Catholic faith. Parliament returned the heresy laws and hundreds were brought before the courts, imprisoned and sent for execution. Among 300 martyrdoms recorded in the Marian Persecutions, only three took place in Wales. Ferrar was one - and one of the first. He was brought many times to the Consistory Court at St Peter's for heresy for his adherence to Protestantism and held in a Carmarthen prison. Eventually, he was sentenced and burned at the stake in the market place (now Nott Square) at Carmarthen on 30th March 1555. In the face of death, he displayed a remarkable faith and courage. There is a memorial to him beneath the Nott monument in Nott Square. The stone which held the stake to which he was bound is now the key stone at the top of Abergwili Church spire in the town. Over the centuries, Saint Peter's has been blessed with a long line of benefactors who have preserved this historic foundation for the present generation. It is more than a denominational religious institution in the town; it is the "VERY SOUL OF CARMARTHEN". For nearly a thousand years, it has been linked with the town's history and each generation has left its mark. It, too, has left its indelible mark on each generation that has worshipped within its walls. Despite the ravages of time, this venerable church stands today as a link between the past and the future - a noble and spiritual heritage which deserves to be preserved for future generations. in writing the church's history. I hope that you found the site informative and interesting. It is updated regularly so do call again! Better still, why not visit our beautiful historic church! How do I find St Peter's on a map of Carmarthen? BY PEOPLE FROM ALL OVER THE WORLD. WAS RESET IN APRIL 2015.